...Journeying Up the Mountain of God: "Silencing the Spiritual Blacksmiths"
At one point in Israel’s history, the country was in one their lowest states of depression and degradation, thanks in great part to King Saul’s disobedience of God’s commands. One of Israel’s enemy - the Philistines - capitalized upon these conditions and achieved military superiority in a great victory over them which resulted in their being virtual masters of the land of Israel. To keep the new Israelite slaves from rising up in warfare against them, the Philistines either killed or imprisoned all the blacksmiths throughout the land. Why blacksmiths? 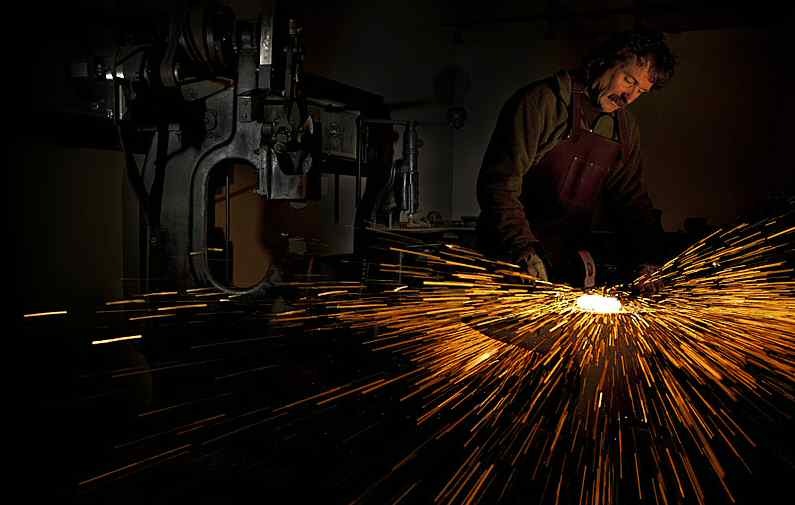 We must first understand what the role of a blacksmith was during this period of time. A blacksmith was a man who created metal objects from wrought iron or steel by forging the metal (i.e. forging is a manufacturing process involving the shaping of hot, near-molten metal using intense compressive forces with tools like a steel hammer). So to remove Israel’s blacksmiths meant there would be no one left to make weapons for war nor would there be anyone to sharpen swords, spears or tools that were necessary for maintaining their farms and working in the fields in preparation for the harvest seasons. The Israelites were thus left strategically immobile and their farmers dependent upon the Philistines for both maintaining and repairing their agricultural tools - often at a much higher price than the fees which were previously charged by the Israeli blacksmiths. This clever strategy by the Philistines acknowledged the blacksmith’s vital role in that culture / time period and targeted their invaluable role / contribution in the preservation of the land of Israel in the areas of defense and commerce (wrt agriculture) – in essence, the Philistines believed that in removing the blacksmiths, they would the cripple the heart / will / means for the Israelite slaves to rise up in revolt. Only 26% have daily devotions; 33% say they have had an extramarital relationship with someone in their church; clergy have the 2nd highest divorce rate of all professions; ~80% graduates from Seminary or Bible College will leave ministry within 5 years; over 70% do not feel they have a close friend in whom they can confide with their ministerial/personal faith struggles; over 4000 new churches launch every year while over 7,000 churches close their doors; 90% work between 55-75 hrs/week and feel fatigue that often leads to burnout ; while over 3,500 people each day left a church last year, over 1,700 pastors chose to leave ministry every month last year with no plans to ever return. So you see – just like with the blacksmiths in Israel in Biblical times, the spirit of the Philistines is both alive and active today amongst the trends and statistics shared above. As many would agree, there has never been a moment in our nation’s history when so many pastors / ministers (spiritual blacksmiths) have been under such fierce attack along so many fronts in their lives. If left untreated, these “fiery darts” from the enemy will continue hitting their targets and the number of genuine spiritual blacksmiths will continue to drop, thereby opening the door for “blacksmiths” from the enemy’s camp (i.e. false teachers; Jeremiah 50:6 & 2 Peter 2:1) who will seek to deceptively enter into the pulpits of God’s Church for the sole purpose of leading many astray (Matthew 24). The battle plan of the enemy will continue to lethally target these spiritual blacksmiths for removal from kingdom service – a plan that if allowed to be successful will result in a church whose role in equipping the saints with the “Sword of the Spirit” (i.e. the Word of God, Ephesians 6:17) will be severely damaged for the spiritual battles of our day and for the battles which are prophetically forming along the horizon of tomorrow. So how can we help thwart the enemy’s plans in taking out the spiritual blacksmiths serving throughout our nation and around the world? One of the first ways to help protect them is to pray both for them and with them. 2 Timothy 1:2 declares that we “pray …for … all who are in authority (over us) so that we can live peaceful and quiet lives marked by godliness and dignity.” (NLT) Having the honor to served nearly 17 years as a spiritual blacksmith, I can testify to no greater sense of peace and comfort than in knowing that there are others who are genuinely praying for me and my family. Secondly, we can all do as the Bereans did who “listened eagerly to Paul’s message (and) searched the Scriptures day after day to see if Paul and Silas were teaching the truth.” (Acts 17:11, NLT) There are many outstanding spiritual blacksmiths who faithfully serve the Lord and His people today with hearts which are fully committed to proclaiming the whole counsel of truth (God’s Word). Sadly, there are also many other spiritual blacksmiths who are shortcutting the spiritual forging process by using worldly tools, man-made plans/programs and/or exalting certain denominational teachings that conflict with the inerrant Word of God. True spiritual blacksmiths gladly welcome their flock to hold their messages / teachings / life actions up against the spiritual plumb line of God’s Holy Word (Amos 7:7-8, Proverbs 27:17). Third, we can encourage them all the more as we see the prophetic events of the Last Days taking place around us (Hebrews 10:25). One of the most powerful ways to encourage spiritual blacksmiths is to personally obey the teachings of the Word of God (1 Timothy 6:2, Hebrews 13:17). You can also encourage them with notes / phone calls of appreciation, by the sharing of testimonies from personal application of their messages / sermons and through your faithfulness to the ministries of the church. You can also greatly encourage them by simply loving them and their families and expressing a genuine thankful heart (Colossians 2:7, 1 Timothy 5:17) for the Lord bringing them into both your life and the life of your church family. A few drops of encouragement along the challenging and sometimes dry trails of life can be truly refreshing. As the days grow shorter to the time of Jesus’ return, the scriptures teach us that a great apostasy (falling away from God’s truth; 2 Thessalonians 2:3, 1 Timothy 4:1-2, 2 Timothy 4:3-4 & Matthew 24:4-25) will take place. For this to occur, many spiritual blacksmiths will have to have been either removed from their kingdom positions of leadership/influence, wounded / crippled in the effectiveness of their service or replaced by false blacksmiths who will surely seek to forge imitation swords (“aluminum foil vs iron;” false teachings-truth) that will fail God’s people at decisive moments in life’s battles. Know that these are all signs spoken of in the holy scriptures which repeatedly remind us of the spiritual urgency of the hour as the day of the Lord’s return approaches. May we each be faithful to pray for and encourage these spiritual blacksmiths as they seek to serve the Lord in helping to prepare our hearts and lives for becoming fully-devoted followers of Christ in life’s journey! …Selah! Today's Spirit-led video (embedded below) is "Worthy - Let All I Do" by CCM Artist Aaron Shust. In addition to the video, I have added the simple, yet powerful lyrics to this moving song / piece of creative ministry. I felt led of the Spirit to select this as I believe it truly reflects the hearts of those genuine Spiritual Blacksmiths to which I am honored to have been included through God's calling upn my life. ...G3! A devoted follower and sojourner of the Way (John 14:6 / Luke 9:23), a faithful husband to my beautiful Christian wife and best friend (Proverbs 31) and a honored father to two precious gifts from heaven above (James 1:17), a daughter and a son. I am most grateful for my salvation in Christ, for my wonderful family and for the honored calling from the Lord to serve in full-time ministry for His kingdom since ~ Fall of 1995!